The word avant-garde is simply a term for the “leftovers” of music that don't fit neatly into any category. Given the breadth of experimental possibilities, it is rather meaningless by definition in conveying any prior sense of what to expect before actually hearing a new musical piece. 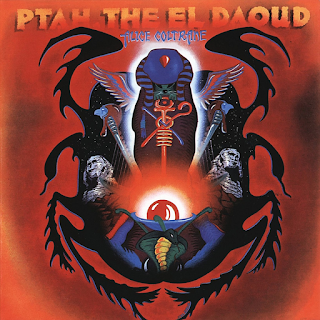 Such is the case for ALICE COLTRANE and her masterpiece PTAH THE EL DAOUD (Ptah is an Egyptian God and El Daoud simply means The Beloved.) This sounds absolutely nothing like many of the other jazz artists lumped into the avant-garde such as Eric Dolphy, Sun Ra etc. Upon first listen it seems to me that Alice simply created something in the jazz world that is similar to what emerged in the rock world that later become known as post-rock, meaning rock instrumentation focused on ambiance and soundscapes rather than preordained musical compositions. ALICE COLTRANE does just that. It is clearly jazz by the sounds of the saxes and flutes, yet it's like the scarab beetle that graces this beautiful album cover. Alice's musical vision is the soft spiritually-infused fleshy part on the inside and the jazz instrumentation is the hard exoskeleton giving it a form. Just like post-rock, this post-jazz has additional instruments not usually heard in jazz. In this case the harp played with full virtuosity by Alice herself. And a super satisfying performance I may add. This album is just brilliant! It is a return to the modal jazz composition of the previous decade that was quickly being abandoned for a more fusion approach in the jazz world, yet it wasn't just being retrospective. It was also fresh and original taking jazz to new places. At times the piano reminds me more of soul or gospel adding a warmth and a gentleness to the ferociousness of the musical performance that feels like a battle between order and chaos and at times it truly does have a free-jazz feel especially when Pharoah Sanders and Joe Henderson are competing on the left and right channels with their saxophones. The free form performances of bassist Ron Carter and drummer Ben Riley show that it really is the sum of the parts that make this album come together. None of the individual instruments would sound right without the contrast. The strange thing about this album is that despite feeling like a mystical spiritual journey the music doesn't particularly evoke any feel towards the Ancient Egyptian imagery depicted on the cover art. Doesn't matter a bit though. I find this music satisfying from beginning to end and wishing more albums of the sort had been made like it. However, I guess that would diminish from its uniqueness. 5 stars.